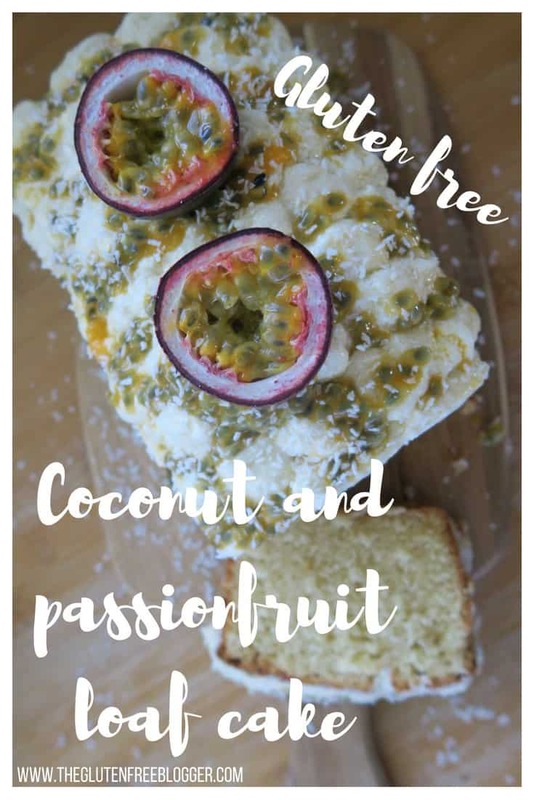 It feels a little bit like summer has abandoned us at the moment after the beautiful heatwave, so why not bring a little sunshine back into your life with my gluten free coconut and passionfruit loaf cake? 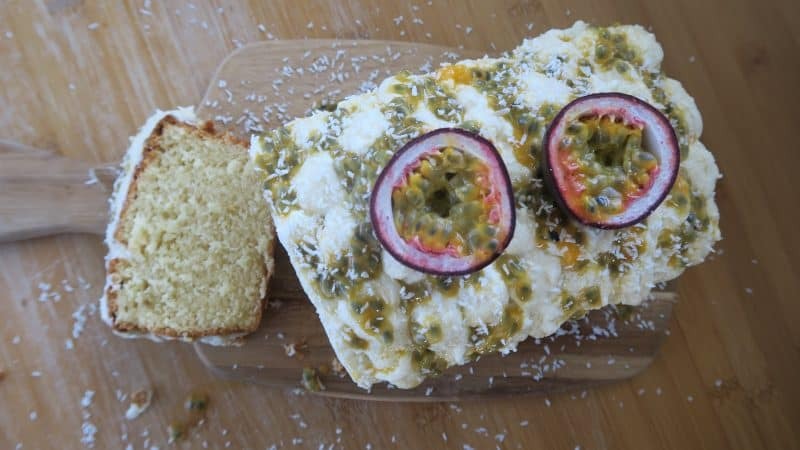 Inspired by a similar, gluten-filled version I saw in Costa Coffee, this coconut and passionfruit loaf cake is not only gluten free, but dairy free too! 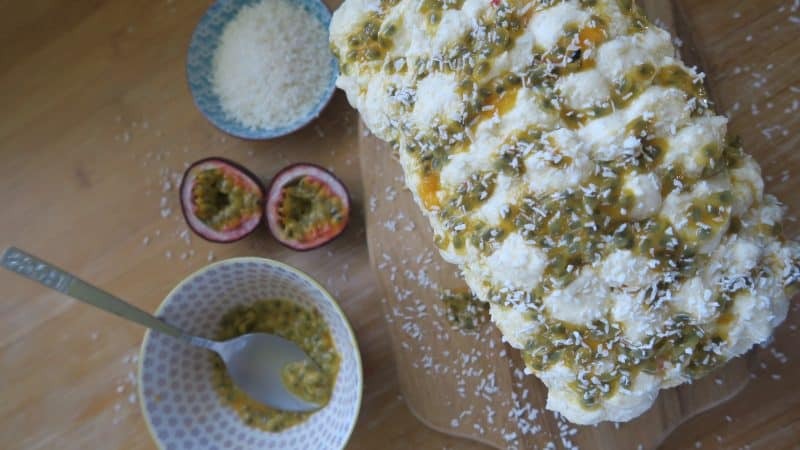 I think coconut and passionfruit are a fantastic combination, and they really do not disappoint when it comes to this loaf cake. The coconut gives a great texture to the sponge, and the coconut icing is delicious and creamy. I love a slice of this gluten free coconut and passionfruit loaf cake with a nice cup of tea – it would be great served as part of a gluten free afternoon tea! You could use butter instead of dairy-free spread in this recipe if you aren’t bothered by the dairy side of things. However, I know a lot of my readers are gluten and dairy free and I didn’t want anyone left out! That’s why I tried to make this cake suitable for everyone. The icing on this cake is a little softer then normal butter icing, because of the dairy free spread being a little softer I think. Be warned when you make this in hot weather it’s advised to get it into the fridge ASAP because that icing will melt in the heat. I learnt this the hard way! 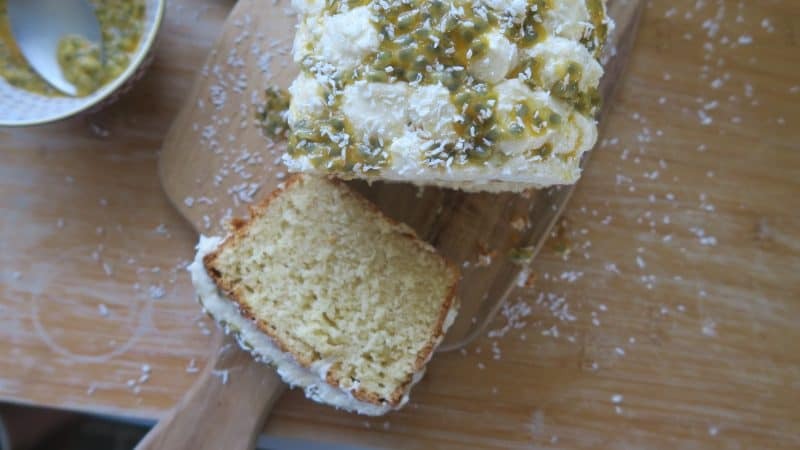 So while I wait for Costa to make their coconut and passionfruit loaf cake gluten free, I think I’ll just be making this over and over again! Are any cakes you’ve seen in coffee shops you WISH were gluten free? Let me know if so, I love a challenge and would love to try and make a gluten free version! I’m always getting cake envy in coffee shops! 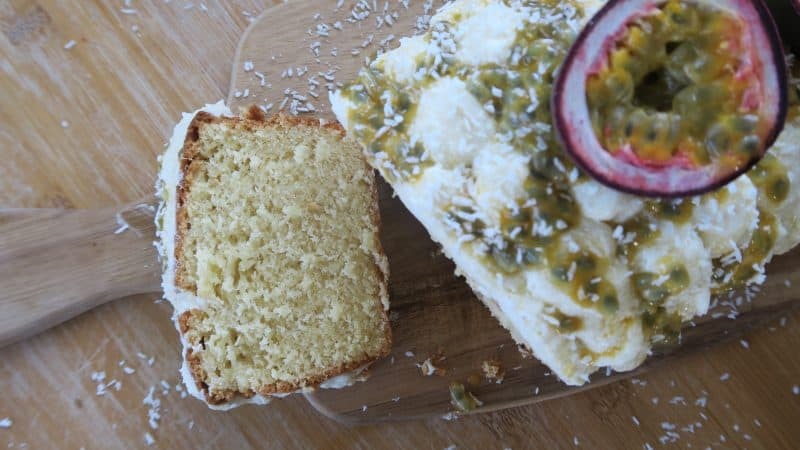 This gluten free coconut and passionfruit loaf cake is also dairy free and bursting with summer flavours. Grease and line a baking tin using some extra dairy free spread. Preheat the oven to 160’C/Gas 3/300’F. Add the dairy free spread, coconut milk and caster sugar into a large mixing bowl and beat with a handheld mixer for 2-3 minutes until combined. Next add the eggs, beating on a slow speed. If the mixture starts to curdle, add some of the flour in. Once combined, add the flour, coconut and xantham gum to the mixture. Beat until mixed well. Pour into the baking tin and place in the oven. Cook for 1 hour and 10 minutes. You’ll know it’s done when you can place a skewer in the centre of the cake and it comes out clean (cooking times may vary slightly between ovens). Place the cake on a wire rack in the tin to cool completely. To make the icing, add the icing sugar, coconut milk and dairy free spread to a large mixing bowl and beat with a handheld mixer until smooth. Spoon into a piping bag and pipe onto the cake. 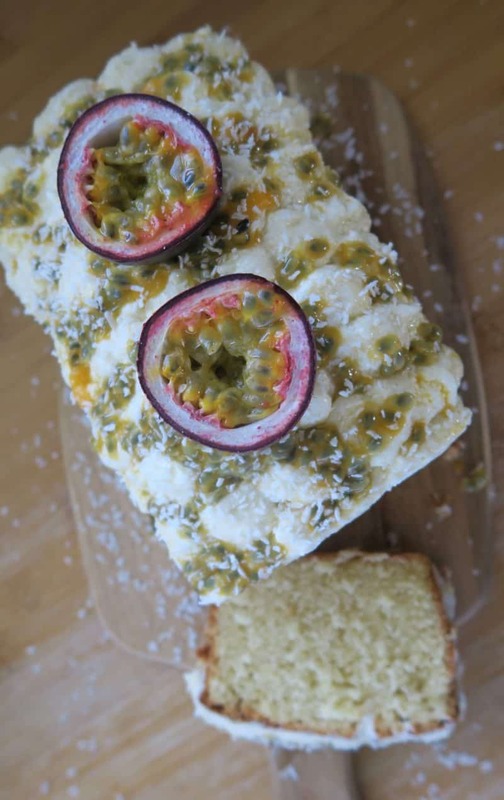 To finish, spoon the seeds from the passionfruit and drizzle over the cake. Sprink with some extra desiccated coconut and then enjoy! Need some more summer bakes?